So I am on a sort of “new project diet” which dictates that I have to finish two projects for every one I start. The crawl cowl was my last new project, and finishing it counted for one of the two completed…. which meant that before I could start something else new, I had to finish something already on the needles. By definition, nothing on the needles is going to be as compelling as something new. Or at least that’s how my twisted brain seems to work. So I had to try a few Works in Progress on for size, to see what would most likely hold my attention long enough to finish it. I was feeling pretty unmoved. That is, until I picked up the neon-bright toddler sweater. Bless the dear departed, but it was two enormous garbage bags of almost entirely acrylic yarn. Most of it of a rather antique vintage, i.e. from back when this sort of yarn was cool, and/or all you could get/afford, so I cast no aspersions on the taste of the purchaser. I went through it all, grouping together sweater quantities of what looked good together, seeing if I could salvage anything that I would genuinely like. I really wanted to give this yarn a chance. But eventually I had to accept that my own stash, which is more to my taste, has grown far too large for me to justify knitting with any of this stuff, let alone keeping it around in the back of a closet. So most of it went back into its bags, slightly better organized, and went to a friend who will actually use it. Naomi, however, had other ideas. 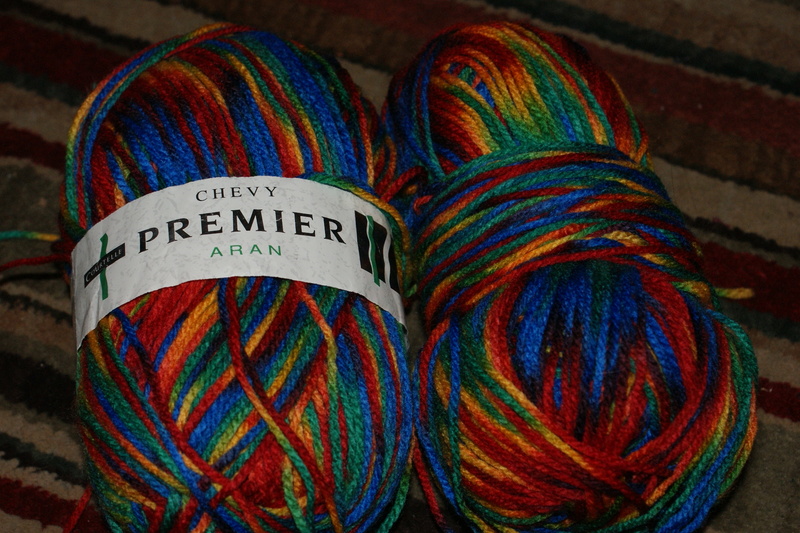 While I kept trying to sort, she pulled out three balls of this shocking rainbow yarn. She played with it, she pulled bits of it out, she even rubbed it on her face as if she thought it was soft. (I had to shudder a little bit.) Finally I caught the hint: she had picked this yarn. Really and truly. And would I respect her choice, support her unique point of view, even when I disagreed with it rather strongly? I cast on within a few weeks. The yarn had no gauge information beyond “aran,” but it looked about right for a heavy worsted. I had bought myself a copy of Debbie Bliss’s Design It, Knit It: Babies, and the simple rolled hem cardigan looked about the right speed for such a busy mess of color. I cranked out the first front, steeling myself through the random pooling and squeaky needles. But I absolutely stalled out on the second front. I kept telling myself I wasn’t working on it because I couldn’t find the second needle, but when I pulled it out for an inventory shot, the needle was right there in the project basket. So I doubt that excuse was entirely honest. This time, when I pulled it out, after sampling my big shawl, staring at my big sweater, futilely flailing at the interminable spinning project, and trying the endless blanket, something absolutely gripped me about this project. I didn’t care about the weird pooling, or the squeaky yarn, or the weird mistakes I’d already made. I was gripped by one thing. This would be over fast. Within five days, I had two fronts, a back, and two sleeves. Another day gave me a hood, and it was sewn up in half a movie. It took longer for me to get around to going to the yarn store to get the single required button than it did to finish knitting it! The little pattern was quite fun. It has nice a-line shaping, and the big hood hangs fetchingly, though in stiff acrylic it more perches on the shoulders. The point of Design It, Knit It: Babies is to give you some principles of design and ideas to help you make your own patterns, but I confess, bought it for the example patterns. They are just so cute! And go up to large enough sizes that I’ll still be able to use them on Naomi for a bit. It’s a bit striking to contrast this acrylic yarn with the eggshell pink Cashmerino Aran of the sample, but I still think it was the right choice. She’s like a goofy little hobbit about to go on an adventure. Congratulations, dear Rebecca! More joy, more love, more of the awesome Osborn family!